I think you can safely argue that I am a cheerleader for small living with a family and find any discomfort or inconveniences are overshadowed by the many upsides of living small. That being said, each new season brings challenges that take a bit of re-framing and creativity. Recently, entertaining in a small space has been on my mind. When we just had one baby and most of our friends didn’t have kids yet, entertaining was pretty easy. We kept the music on and talked in normal voices and Theo was able to sleep in his bedroom. With a baby and a 3 year old it got a little more complicated and visits were a bit shorter relying more on the kindness, flexibility and generosity of friends. 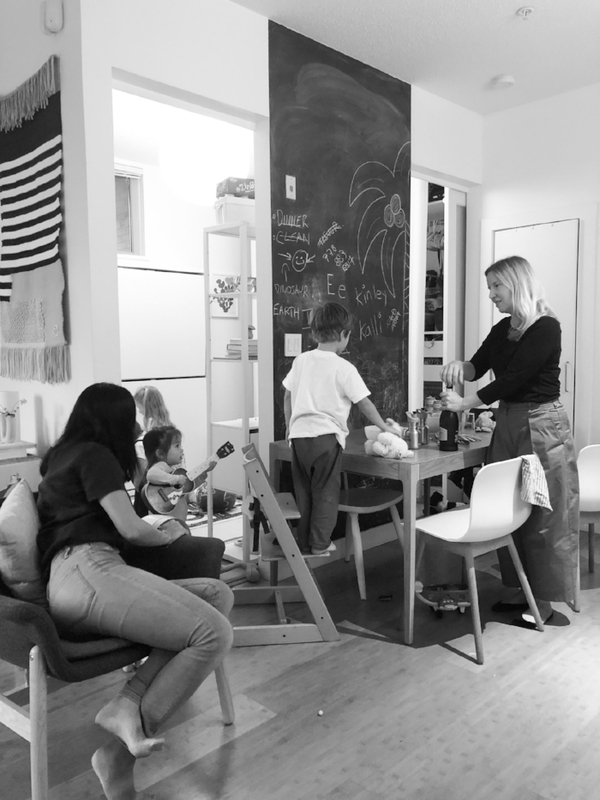 This new season of life with a 5 year old and a 2 year old and now with many of our friends having kids and babies has resulted in some chaotic and loud dinner parties. Sometimes they are full of fights and meltdowns and sometimes they are joyful and harmonious. After a couple chaotic evening hang outs with lots of adults and kids I was starting to feel like we couldn’t entertain in our space. This DID NOT sit well with me. As an advocate for small city living I don’t think sacrificing entertaining in your own space is acceptable. So I took a look at what was making our dinner parties with kids stressful and tried to implement some changes. Below are a few patterns I noticed and how we have implemented solutions to make entertaining in our small space possible and more enjoyable. Hopefully they are helpful to you too! 1) Kid’s Eating - I found all the parents were spending a good portion of the night trying to get their kids to sit and and eat when all the kids wanted to do was run around and play. This meant we were fighting with our kids and the adults weren’t connecting and visiting. What was the point of getting together?? 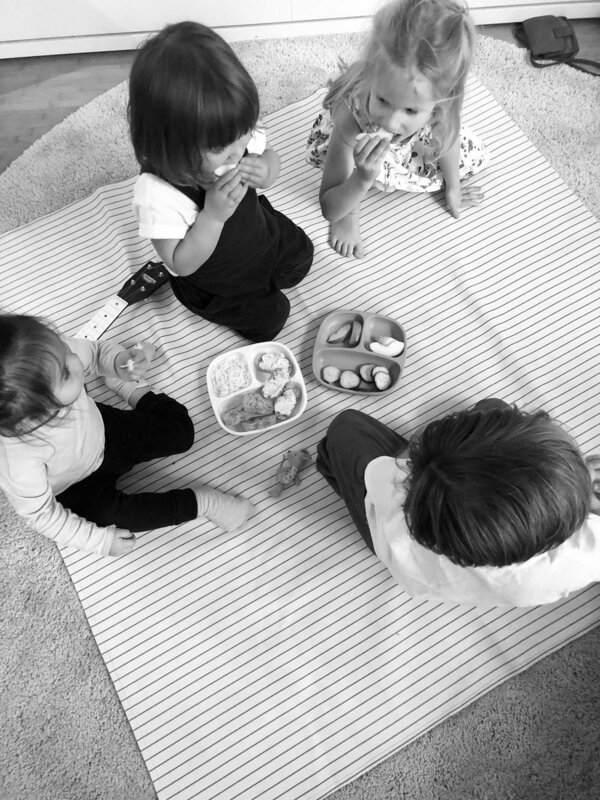 Solution - We put out snack trays of a variety of kid friendly foods on a Gathre mat in the living room so the kids could snack when they were hungry and play when they wanted. The battle was over and we all enjoyed eachother’s company more. The kids responded well to the “indoor picnic”. 2) Seating - we have an extending table with 4 chairs, 1 side table and a highchair that double as additional seating. Beyond those 6 seats someone ends up on the couch or the living room chair. We’ve recently had up to 8 adults over at a time and with lots of kids someone is usually not sitting for their dinner but having enough chairs would be ideal. Solution - I need to find 2 very slim but sturdy folding chairs and room to store them in one of our closets. Open to any suggestions!! Setting up our gathre mat in the living room for the kids relieved the need for seats for any kids. 3) More Space - With kids ranging from 2-5 we have found the bunk beds to be a bit of a safety hazard requiring a couple parents to be on guard at all times so the little ones don’t fall off or things aren’t thrown off the top bunk (oh this doesn’t happen in your home? Just ours? cool). Solution -The luxury of our wall bunk beds means we can fold them away creating a full play room for the kids. We set up the play tent to create a soft cozy escape for any kids needed quiet time. While we don’t have the luxury of a spare room or basement for the kids to play we are making the most use of the small space we have and creating safe play zones in our small space. 4) A Break - Usually we are entertaining on a Friday or Saturday and the kids are tired and a little crazy. Parenting is wonderful but it is hard work! We are getting together so the kids can play but also so us adults can talk and share. We have low expectations for the night, it’s just about getting together but sometimes the kids aren’t getting along and everything is falling apart. Solution - After the kids have snacked a bit and played hard and they are starting to get a little extra, we’ve all agreed to put on a show. We set up the laptop in the kids room and couch pillows on the floor and try to find a show that makes everyone happy. This bought us an hour of peaceful adult conversation over wine. And the kids considered the night a great success. As always I love to hear how you entertain in a small space with adults and kids. In the past we have also just had everyone eat on the floor or the couch but have found with lots of toddlers running around it can get a bit messy. As with everything in small space living (and life) it is better to count your blessings than cry over spilled milk (or wine). Nothing in our space is too precious and time with friends and family is what matters most, no matter how cozy or loud it is!